Vacheroy Gite - Country Cottage Holiday Home in Charente-Maritime, France. 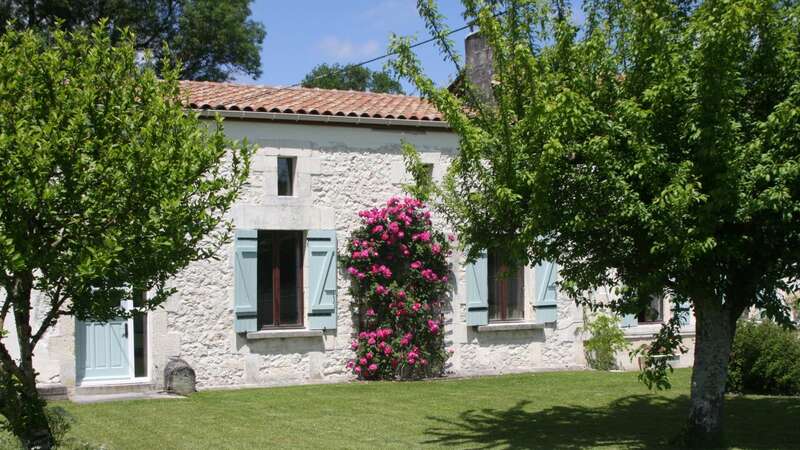 A Luxury holiday home set in 2 acres of gardens in Charente-Maritime, France. Our cottage sleeps up to 8, has beautiful country views, private patio area & heated swimming pool. Here, find the essence of rural France, vibrant markets, vineyards, great restaurants, historic villages & lots more! Come to Vacheroy to relax in the brand new luxury, 10x5m in-ground heated swimming pool, take in the beautiful country views & become part of French way of life. In July & August local towns hold gastronomic evening markets where the streets are filled with locals & tourists alike. Sit out, drink in the atmosphere & dine on an array of local & exotic foods. See our local guide for all the fabulous activities both here & in the vicinity. Vacheroy is a beautiful character cottage, with a large beamed lounge, a romantic mezzanine double, a large en-suite twin room & an attic room for children. It has a partly shaded private terrace area with seating, outside dining area & BBQ adjoining the fully equipped kitchen. In the garden there are childrens swings, a shaded vine covered seating area, table tennis, games (boule, badminton & croquet) & of course, the fabulous pool & sunbathing deck. Enjoy the local markets, vineyards, country walks, lakes & restaurants right on our doorstep or venture a little further afield for historic cities, beaches, medieval villages, the great Bordeaux vineyards of St Emillion or the Chateaux of the Medoc. On the borders of Aquitaine & Charente Maritime, the area offers thousands of years of history for you to enjoy. Roman remains, walled villages of the Hundred Years War & religious wars & the centre of the wine trade between France & Britain, the wonderful UNESCO World Heritage 18th century city of Bordeaux itself.